Large Santa Belt Pet Dish. Inside it reads "Santa Paws" with a Paw Print. Measures 3"H x 6 1/2" Opening. 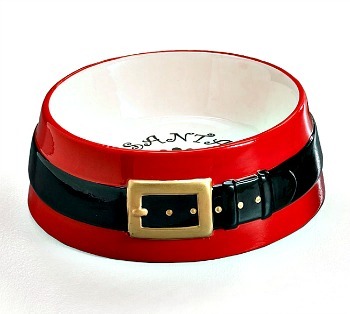 Perfect for Any Size Dog or Cat. Made of Raised Ceramic. Hand Wash Only. FDA Approved.